From Goodreads ~ Colin Wright and Mia Blair grew up in Icicle Falls but they left years ago - and not on good terms. Now Colin's grandmother, Justine, has died and they've come home to honor this woman they both loved. That's when they get some unexpected news. They're about to inherit something. Jointly. They just have no idea what. It turns out that Justine's designed a treasure hunt for them, like the ones they enjoyed when they were kids and best friends. But they're not kids anymore and they sure aren't best friends. As for that young love they once shared? Well … it's complicated. 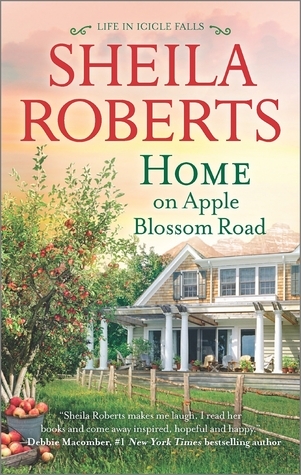 On the trail of Justine's treasure, they follow a series of clues that take them down memory lane - ending up at the orchard on Apple Blossom Road. What will they find there? And what did Justine know that they didn't? Justine had two children, Beth and Dylan. When Mia was young, her mother died and her father took off. Beth took her in and raised her as her own. Mia considered Justine her grandmother. Dylan has a son named Colin and his mother took off when he was young. Mia and Colin grew up together and were best of friends. When they got older, that shifted and they fell in love and had plans to get married once they finished university. Because of a misunderstanding, they split up before they finished school and didn't have anything to do with each other and they moved away from Icicle Falls. It's about ten years later, Justine has just died and Colin and Mia come home for the funeral. When the will is read, Justine has left them something but she sends them on a treasure hunt to find it, which is reminiscent from their childhood. This is the eleventh book I've read by this author (and the ninth in the Icicle Falls series ... it works as a standalone). Written in third person perspective, the focus shifts among the characters and you get to know what they are thinking. The story jumps back and forth from today to the past, as Mia and Colin remember their memories but also through letters Justine had written to her mother and sister. As a head's up, there is some mild swearing. At the end, there are some recipes. Thanks for visiting my blog! I agree with your review. Her books are nice and "feel good".